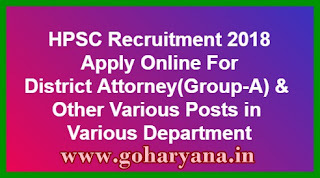 HPSC Online Form 2018 - Apply Online for 10 Posts: Haryana Public Service Commission(HPSC) has released the post of District Attorney(Group-A), Audit Officer Cooperative Societies(Group-B), Asstt Director(Archives) (Group-B) and Election Tehsildar(Class-II) in various departments. Age Limit: Candidates age should be 30 to 42 years as on 01-08-2018. 1. Candidates should have Degree of Bachelor of Law from a recognized university. 4. Fee Exception for all PH Candidates. 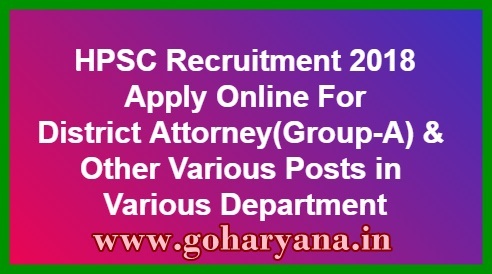 How To Apply: Interested & Eligible Candidates can apply online through www.hpsconline.in from 01-08-2018 to 30-08-2018. Last date for payment of fee - 30/08/2018 Upto 24:00 Hrs.